PennTech offers a state-of-the-art aseptic filling machines. The machines is designed specifically for low to medium speed pharmaceutical, biotech and animal health filling and rubber stopper inserting applications. When it comes to pharmaceutical liquid filling, PennTech offers a choice of filling machines and dispensing methods. Model FSC-1R: a 1-up filling, stoppering and capping system for 2-100ml vials with an output of up to 30 vials per minute. 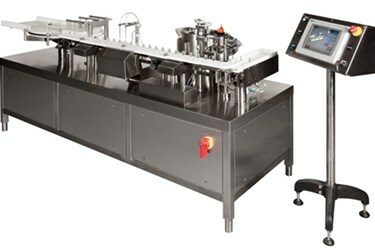 Model FS-2: a 2-up filling and stoppering machine for 2-100ml vials with an output of up to 100 vials/minute. Model FS-4: a 4-up filling machine with a vacuum rotary stopper-inserting disk for 2- 100ml vials with an output of up to 200 vials/minute. Peristaltic Pumps: If you’re looking for high precision peristaltic pumps, don’t look any further. We apply the highest precision and most advanced pumps that are driven by PLC-controlled individual servo motors. The rollers are positively driven, substantially increasing the longevity of the tubing, hence maintaining the fill accuracy. Drip-free filling is an inherent feature. Gamma sterilized, disposable filling systems are available, rendering cleaning and sterilizing superfluous, while preventing cross contamination. Rotary Piston Pumps: PennTech’s rotary piston pumps are constructed from a single piece of 316 stainless steel. High precision seal-less and hard-coated matching sets provide high accuracy and repeatability throughout the entire batch.